Even if you're an expert chopstick user, there are still times when flatware comes in very handy. A knife and fork, for example, would prevent things like sauce dribbling down your shirt as you try to munch your way down that spear of Chinese broccoli. And how else will you eat your soup but with a spoon? 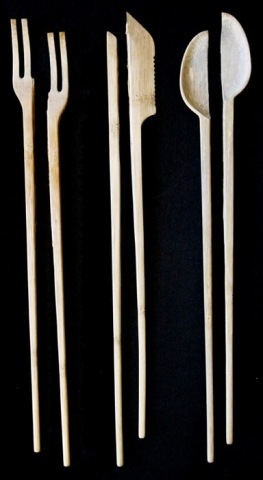 For these occasions, and for those who prefer not to use chopsticks at all, there's Choplery™, Peter Francis Pracilio's new design, made from bamboo. Choplery is disposable, just like the bamboo chopsticks that come with your Chinese takeout, but they are so much more functional. Obviously, you will want to use the flatware mode of Choplery to do your cutting before you break into chopstick mode; there's no going back! I hope we can all look forward to receiving Choplery with takeout from our favorite forward-thinking Asian restaurants. Bamboo is fast growing, biodegradable, and generally grown in quickly replenished and controlled forests. Plastic flatware is so yesterday and so wasteful. Ummnn, stabbing or cutting your food is a faux pas in areas of the world that use chopsticks. I don't think you will ever see this product go to market. I think people in other parts of the world, like the US will buy them.